Cradle Size 25" x 11.7" x 4.1"
Scale Size 25" x 11.7" x 4.1"
Simple DesignYou'll sure have a hard time trying to find a more easy to use scale for weighing your little ones. This pediatric scale's two key operation and useful features make accurately weighing babies a simple task for anyone. Whether it's mommy and daddy weighing their baby at home, or a nurse getting weights of newborns in the nursery...anyone can operate and care for this baby scale. Tare FeatureThe tare button on this baby scale can be pressed to "zero set" the weight on the scale. You can then add more weight, and the display will only show the weight of what you're adding. This sure does come in handy when ya want to add a mat to the platform, or if baby wants to be weighed with his favorite blanket. 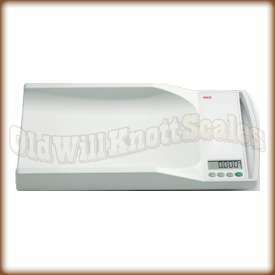 Auto Hold FeatureWith most scales, it can be hard getting accurate weights of wiggly little babies. Not with the Seca 334. When you weigh with this infant scale, the weight display will flash until a stable reading is taken. Once the scale has a stable reading, it will automatically freeze the display and hold the stable reading until the next time you weigh. It Remembers The Last Unit Ya UsedIf your application needs weights in the same unit of measurement, (like pounds for instance), it can be a real pain if your scale always turns on ready to weigh in kilograms. It's a good thing the Seca 334 turns on displaying the unit of measurement you were using when ya turned it off. Auto-Off FeatureIf ya have ever had the batteries in something run out because you forgot to turn it off, you'll realize what a blessing this feature is. The Seca 334 will automatically turn off after a few moments of inactivity, saving battery power and money. 2 YEAR MANUFACTURER'S WARRANTY!Seca Scales offers a two year warranty against defects in materials and workmanship. In the rare case ya have a problem with this scale, contact Seca for a repair or replacement scale.